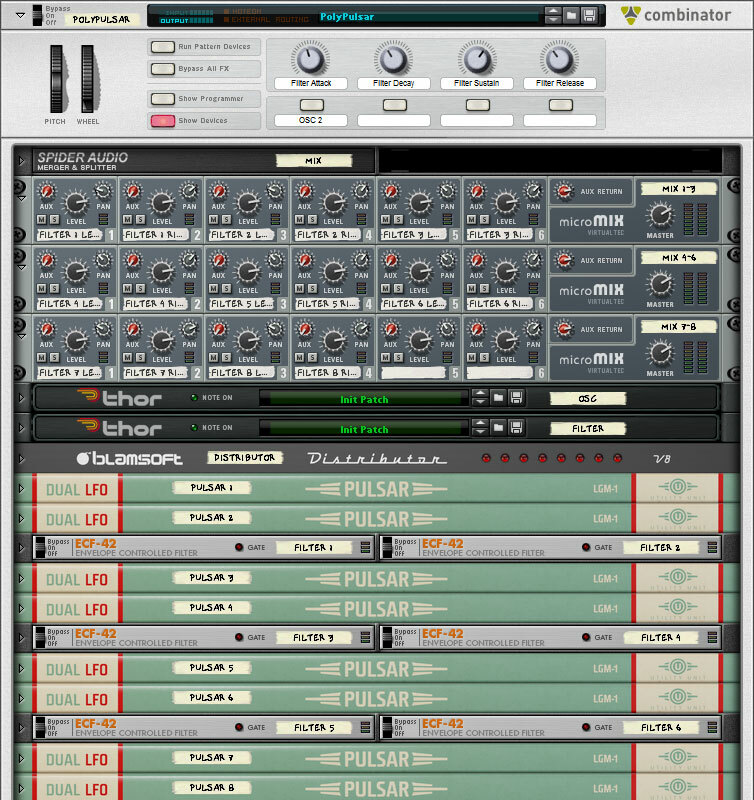 Pulsar is a great LFO and simple mono-synth. 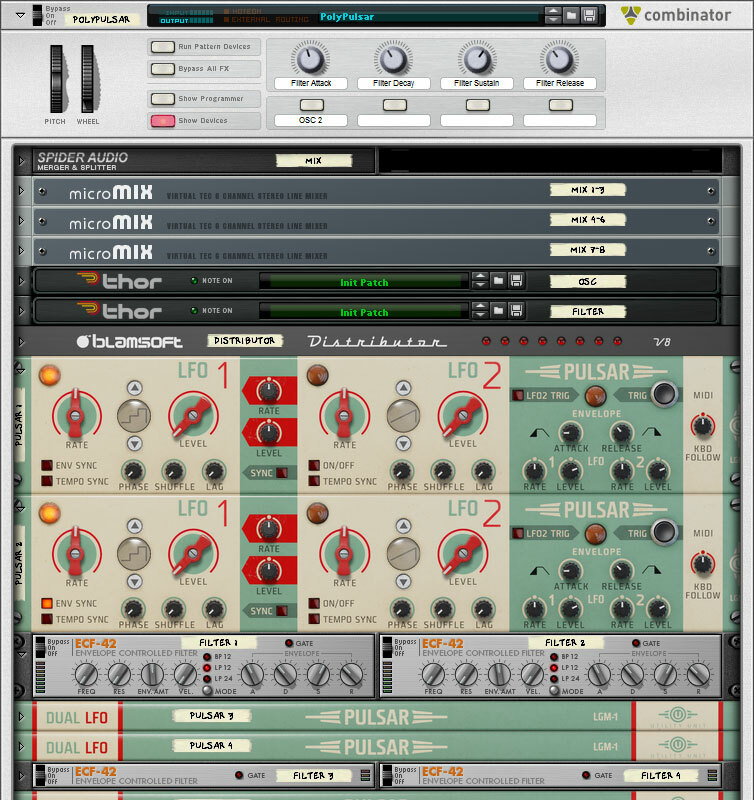 But Distributor can take Pulsar to the next level, a full blown Polyphonic synthesizer. The routing for this is quite involved but it’s available for you in a Combinator. You can start from there and tweak it to suit your taste. We’ll go over what’s in the Combinator and how to use it. Let start with an overview of what devices are in the Combinator. There are three line mixers to mix the oscillators, two Thor’s to act as controllers, a Distributor for handling note and gate signals, and 8 Pulsars with 8 ECF-42 filters for the voices. There are some Spider CVs at the bottom to handle the routing. The Combinator rotary controls have been mapped to the ADSR envelope of the filters. Button 1 enables Oscillator 2 on the voices. The Mod Wheel adjusts the shuffle setting for the oscillators, and the Pitch Wheel provides a one octave pitch bend. The mixer has each oscillator on a separate channel. 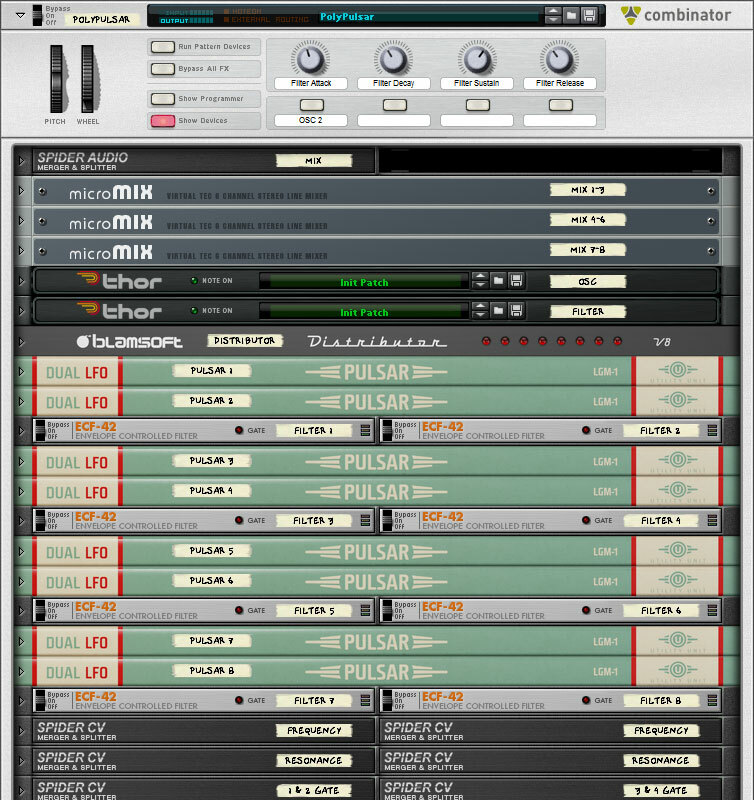 Pulsar has two oscillators so each voices gets a pair of mix channels. By default oscillator 1 is panned left and oscillator 2 is panned right. The knobs on the Thors control the oscillator tuning and the filter settings. The first Thor has Detune and Drift knobs. Detune adjusts the oscillator frequencies so that oscillator 1 and oscillator 2 are not in tune with each other. Drift provides a slow random frequency drift on the oscillators. 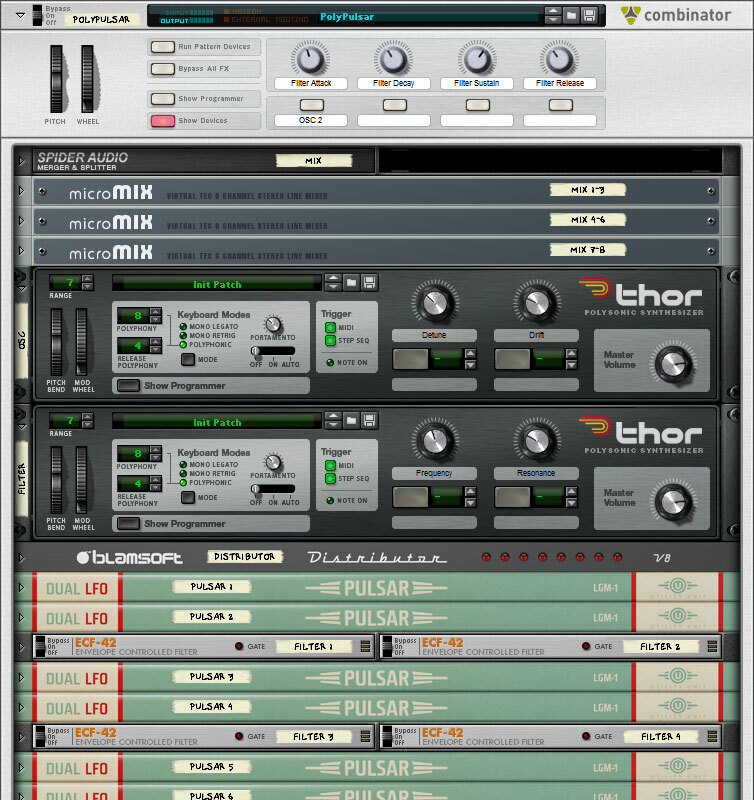 Note that LFO 1 is used so the Thor needs to receive notes from the Combinator. The second Thor controls the cutoff frequency and resonance of the filters. Each voice consists of a Pulsar and an ECF-42 filter. Pulsar has selectable waveforms for the two oscillators. The envelope attack and release are acting as an amp envlope and can be adjusted. To add pitching effects you can adjust the envelope to rate knob. The rate knob is being controlled by the Pitch Wheel and detuning the oscillators is done with the Thor knob. An interesting effect can be achieved by adjusting the oscillator 2 to oscillator 1 rate knob. The filters have a few settings as well. They can be set to two different lowpass modes or bandpass. Also, the envelope amount and velocity effect can be adjusted. Now you’ve seen the whole Combinator. Try it out and see how you like the sound of Pulsar’s oscillators with the dusty but not forgotten ECF-42. Leave mapping ideas or other comments in the section below. Distributor was best RE purchase ever made. Heck I like all your stuff still saving to buy Viking.